Three-storied building of austere morphological elements. 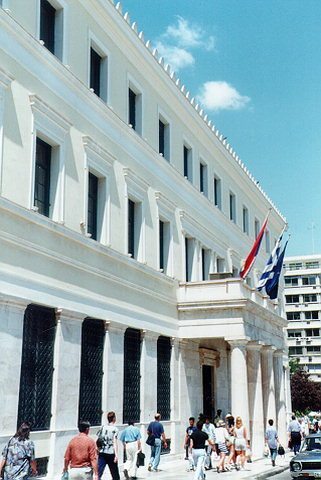 The marble propylon at the entrance is one of the characteristic elements of the building while the ground floor is also covered with marble and the openings in between are filled with decorating ironworks. The main entrance has a marble door-frame that ends to a decorating marble jamb. The stories are separated by a long cornice. Characteristic element of the facet is the marble balcony. 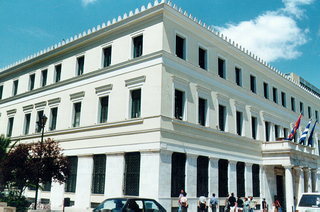 When the City of Athens got a 130,000 drachmas loan by the National Bank of Greece, it decided to built the Municipal Mansion on the last remaining area from the people's garden, on the western side of Athinas Street. The architectural study was given to the architect P. Kalkos (during the mayoralty of P. Kyriakou) and in October 1872 the construction started to finish less than two years later in May 1874.